On Thursday night last week there was an amber warning in place for heavy snowfall overnight and all day Friday. It was also bitterly cold. Despite turning the heating on and having the fire on as soon as I got home, it still felt cold so I decided that in order to warm the house up a bit more, the best option was to turn the oven on. And if the oven is on then it’s rude not to bake something. So I decided to try out a new recipe for gingerbread biscuits – they keep for ages and they’re perfect dunked into tea. I cut some of it up to build some sledges and then the rest I used to make mittens. Do you need some mittens to warm up? I have a recipe for gingerbread which I’ve been using for the last couple of years and I love it. However, I decided to try a new one out. Since I’ve made most of the other biscuits in the Peggy Porschen Boutique Baking book and they all worked really well, I decided to give the gingerbread a go. It smelt amazing as I was making it and even better when it was being baked. It definitely helped to make the house feel much more welcoming than the freezer I had walked into when I got home. I don’t have a mitten cutter so I just cut them out with a knife. 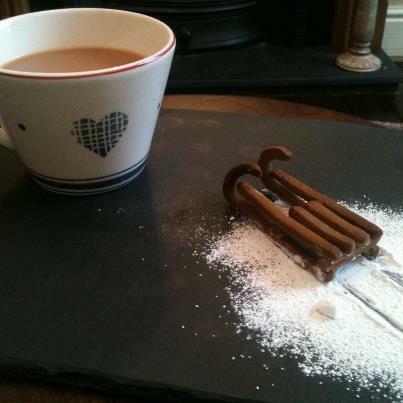 Since I was using a knife, I decided to cut out some strips and build a couple of sledges out of gingerbread! 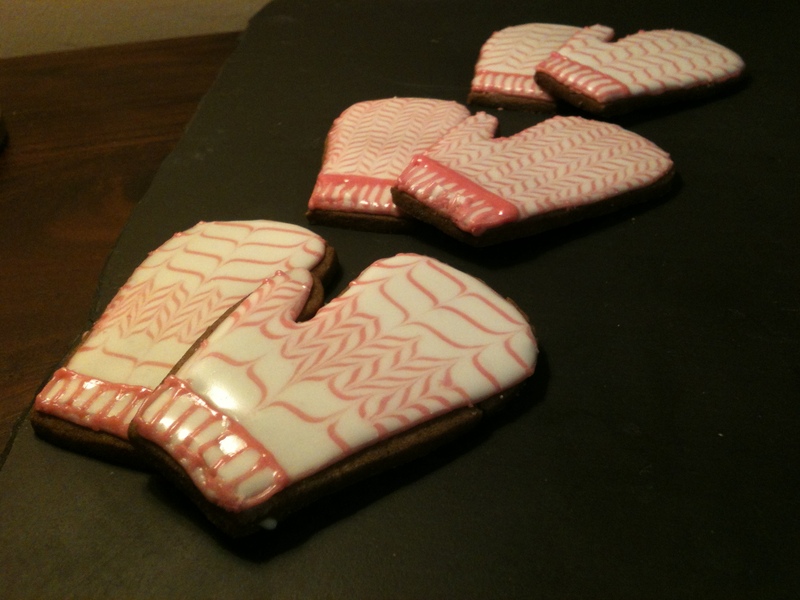 The mittens were decorated with royal icing – I filled a piping bag with pink icing and a Wilton no. 1 nozzle and piped an outline round each mitten. I then flooded the inside of each one with slightly runnier white royal icing. 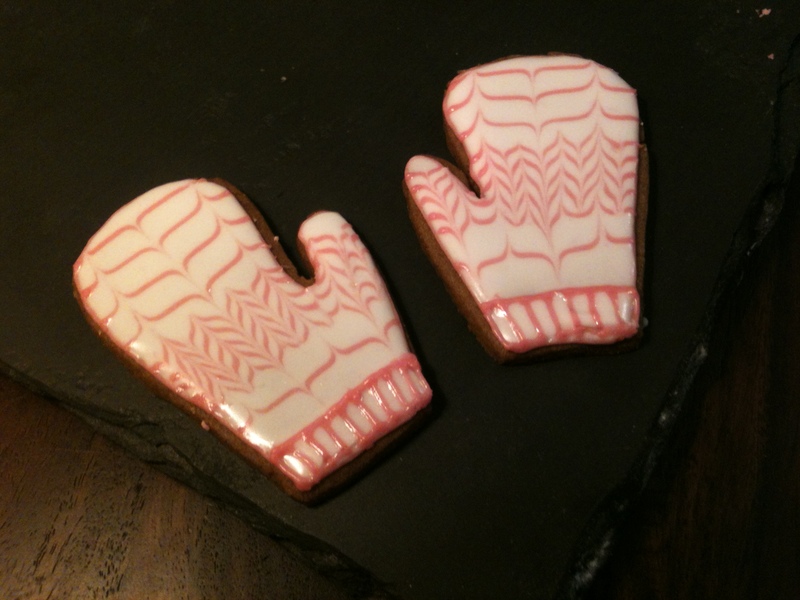 Using the piping bag with pink icing in, I piped lines across each mitten at various widths. Then, using a cocktail stick I dragged it all the way down the middle of the cookie, then moved along a bit and dragged it up, then down etc to create the pattern you can see on them. I finished each one off by piping some stripes at the bottom of the mitten. The sledges were stuck together with small dots of royal icing. Here’s the recipe – definitely worth the extra effort compared to the other biscuits I’ve made from the same book. Place all the ingredients, except the butter, bicarb and flour, into a saucepan and over a medium heat, bring to the boil while stirring constantly. Remove from the heat and gradually stir the diced butter in until combined. Add the bicarb (take care as it will swell up). Leave to cool to room temperature. Once cool, stir in the flour and mix to form a slightly wet, sticky dough. Wrap the dough in cling film and chill in the fridge for at least 2 hours. Roll the dough out to 5-6mm thick on a lightly floured surface and cut out the desired shapes. Place slightly apart onto a prepared baking tray. Chill in the fridge for at least 30 minutes. Preheat the oven to gas mark 6 (200 C). Bake for 8-10 minutes (depending on the size of the biscuits) until they spring back when touched and are slightly darker around the edges. Leave to cool and then decorate. I love these mitten biscuits! They are brilliant! Just been having a browse of your blog after you left that lovely comment – your baking is fab! thank you! I love all your baking too – I found your blog through the blog of a friend I used to work with (Julia at Cafe Lula). After I’ve spent this weekend eating up all the food in my freezer to create room for my ice cream maker, I will definitely be making your banana ice cream!